Ozette is a beautiful white squirrel marked with just a touch of gray down her back and on her head. She has come to the forest known as Farlandia on the advice of her grandmother, The Divine Miss Piddlewinks, who had given her a golden acorn. 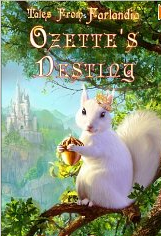 Ozette had been blamed for the encroachment of humans into their world because she was different from other squirrels. Upon reaching Farlandia, she planted a golden acorn. The forest bloomed with life, fairies, elves, nature, royalty, and all sorts of mythical creatures. This book will entertain anyone from age seven through seventy. Its characters spin a tale of adventures that teach many lessons, cooperation, team work, loyalty, bravery, self-sacrifice and numerous others. At the beginning of the book we meet a scruffy white dog named Duchess Zorina who got lost while exploring outside the palace of Queen Beatrix. This turns out to be the beginning of Ozette’s adventures as she and her friends rescue “ DK.” Ozette gets to ride on a unicorn to visit the palace. The Queen insists on rewarding Ozette, giving her a crown and making her queen of the forest. Ozette has long been the humble caretaker of the forest, and her friends involve her in many of their foibles. She experiences life as a hummingbird, rides a parachute, and has her fur dyed pink! She remains a steadfast friend and never deserts a friend in need, even when he has been sprayed by a skunk! Like a true mother hen, Ozette feels a responsibility for all the creatures of the forest. She does not fear responsibility, but she is never overbearing nor does she want to impose her will upon others. There are many touches of humor. Oliver’s boxer shorts disappear only to emerge as an elaborate bungee jump game for Ozette’s coronation festivities. The spiders weave an elaborate web parachute for her that has been dyed lavender. The Spice Squirrels are singing on stage, while birds and cicadas maintain a steady beat! Oliver, the elf has been busy in his kitchen baking all sorts of goodies. In fact, the author provides a list of delicious recipes that the reader will enjoy making and eating after reading the book. Young children will enjoy the book if it is broken up into chapters as a read aloud. Older children and adults will fly through its approximately 160 pages as the fast paced story will compel you into quickly finishing it. I am looking forward to reading many more of Ozette’s adventures and the nuggets of wisdom that she drops for us. If you enjoyed reading this post, please subscribe by clicking on the word Follow in the lower right hand corner or hit the orange RSS feed button at the top right of this post. 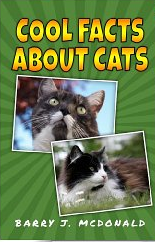 The author claims to have written this book for children but I am fairly sure that any one reading it will be astonished by the number of facts you did not know about cats. It really does not matter whether you a cat lover or not, you will be pleasantly surprised. There are beautiful photographs accompanying the text which is presented clearly and succinctly so that even beginning readers will have no trouble handling it. My only criticism is that perhaps the presentation of facts could have been better categorized. Cats have lived in human homes half the amount of time dogs have, yet their appearance and behavior have not changed in the last 35 million years! Depictions of cats are drawn on ancient walls. Archaelogists have found more than 300,000 mummies in ancient tombs and many of these had embalmed mice to prevent them from going hungry in the afterlife. When a family cat died, the members shaved their eyebrows as a sign of mourning. The Japanese believed that cats had the power to change into super spirits, and Buddhist spirituals used them as surrogates. In many ways cats are similar to humans. Every human has a set of unique fingerprints; every cat posseses a unique nosepad. The organization of a cat’s brain is similar to that of a human as it is the center for processing emotions. Cats dream like humans do, they lose their baby teeth, and they can be blood donors for other cats. They have good memories and may hold something in memory as long as sixteen hours. If you spend time talking to a cat, it is more likely that the cat will talk back to you. Like humans, they may give you the silent treatment if you ignore them! Yet, there are many differences as well. Cats move the left front and back leg together as they walk. The only other two animals in nature that do that are the giraffe and the camel. Cats’ vision is better than that of a human, but their color sensitivity is poor. A cat’s whiskers are controlled by muscles in its face and are used for balance. The average cat has twelve whiskers on each side. When a cat is blind, it can actually move the whiskers in front of its face to prevent bumping into objects using its whiskers like a human would use a cane. You might think that I have already presented most of the information in this book, but that is far from the truth. The reader will find out how cats were used in war and as spies. McDonald explores the senses of the cat and how they work, how they hunt, gender differences, the classifications of cats, and social behavior. The reader learns how to tell if your cat is too fat, if he is in danger of being poisoned, and what you can do to keep your cat safe and happy. Parents, teachers, children and anyone interested in animal behavior will benefit by reading this book and keeping it on hand for reference.